Lyons Spring Clean - This Weekend! The Spring Clean Weekend is fast approaching and we have new and important information below that you need to check out before you load your vehicles and trailers!! We also have an online map of all the other sales across town that will be continuously updated until the event. Follow this link to get the latest version. If you are interested in hosting a sale at your home, please contact Toby Russell to register. 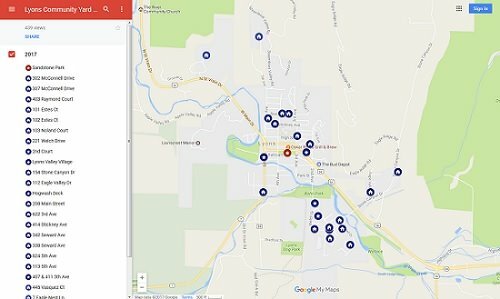 Make sure to get your Garage Sale on the map! On Sunday, May 7, the annual Town Clean Up Day will take place from 9 a.m. to 1 p.m., at the Wastewater Treatment Plant on 2nd Ave. The goal of this event is reduce landfill items by providing responsible disposal of items that otherwise are not normally accepted locally, and at a subsidized cost. Bring items for donation, reuse, chipping, composting, and disposal. For a full list of acceptable items and costs see the updated price list. Be sure to check the list of items at the bottom of the page that will not be accepted. Also, please KEEP TREE BRANCHES AND LIMBS FOR CHIPPING separate from yard waste and other materials or they will not be accepted. Thanks! The US 34 canyon will be open to all motorists from 6 a.m. Saturday, May 6, through 8:30 a.m. Monday, May 8. The Colorado Department of Transportation and Kiewit Infrastructure are always looking for ways to minimize the impacts to the public as the project nears the end of the full closure. The highway is scheduled to reopen for the summer by May 25.